This gorgeous basket-like piece of furniture is the ultimate hanging lounger. 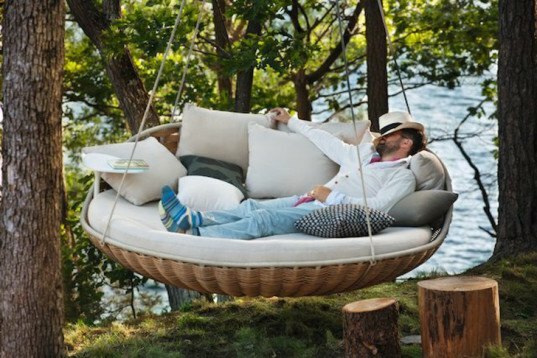 Swingrest was made for outdoor use and provides a floating space for relaxing and enjoying nature. Daniel Pouzet's new design for DEDON can be suspended above water, hung on the terrace or veranda and can accommodate several people. The structure shares part of its name and most of its structure with DEDON’s iconic Nestrest hanging lounger. It is one of the first products to emerge from Dedon Island resort, our Outdoor Living Lab in Siargao, Philippines. French designer and co-architect of Dedon Island, Daniel Pouzet, took his inspiration for the Swingrest from the extra-high ceilings of the resort’s villas. Borrowing the basket-like bottom from his earlier creation, the Nestrest, he created a new work that feels even more spacious (and fits more people) while seeming to take up less space. The swingrest has an elegant suspension system, a 180-degree rotating tabletop and specially-created cord that wraps around its exposed tubing. The piece is available in natural colored weave and comes with an optional fabric curtain cover for creating shade and providing privacy. 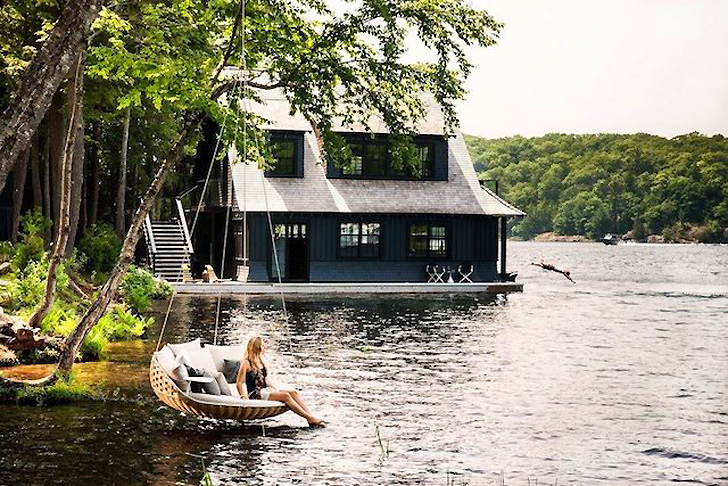 The structure shares part of its name and most of its structure with DEDON's iconic NESTREST hanging lounger. It is one of the first products to emerge from Dedon Island resort, an Outdoor Living Lab in Siargao, Philippines. French designer and co-architect of Dedon Island, Daniel Pouzet, took his inspiration for the Swingrest from the extra-high ceilings of the resort's villas. Borrowing the basket-like bottom from his earlier creation, the Nestrest, he created a new work that feels even more spacious (and fits more people) while seeming to take up less space. It has an elegant suspension system, a 180-degree rotating taletop and specially-created cord that wraps around its exposed tubing. The piece is available in natural colored weave and comes with an optional fabric curtain cover for creating shade and providing privacy.